Preheat oven to 450ºF (230ºC). Cut three 10-in. (25-cm) pieces kitchen twine. Set aside. Cut pork along its length, being careful not to cut through the meat so tenderloin opens up like a book. Season both sides of pork with half the salt and pepper. Lay twine on work surface, evenly spaced under the pork (cut-side up). In large bowl, combine brown sugar, cumin and remaining salt and pepper. Add cauliflower and carrots. Mix to coat vegetables. Set aside. In a medium bowl, combine rice or quinoa, raisins, shallot, thyme and mustard. Mound rice mixture in a “strip” along centre of pork, using your hands to pack mixture together. Bring up ends of twine on both sides of the pork and knot securely, enclosing the filling. 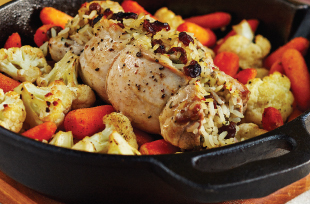 Add half the oil to an ovenproof skillet or roasting pan and set over high heat on stove. Place pork in centre of skillet or pan, tied-side up. Surround pork with cauliflower mixture and drizzle with remaining oil. Add broth to skillet. Turn stove heat off. Cover skillet tightly with foil. Roast pork in preheated oven 20 min. Remove foil and continue to roast until juices run clear or a meat thermometer inserted into thickest part of tenderloin reads 145ºF (63ºC), about 5 min. Rest tenderloin 5 min. before slicing to serve.